This Intermediate Bitcoin Guide was created to give users a bit more in depth look at Bitoin, the technology and protocol. We advise you read through the Introductory Guide before going through this guide. This information was collected from various sources and put together by the team at SecuraCoin. We hope it is informative and if you have any suggestions on improving it, please don't hesitate to contact us. 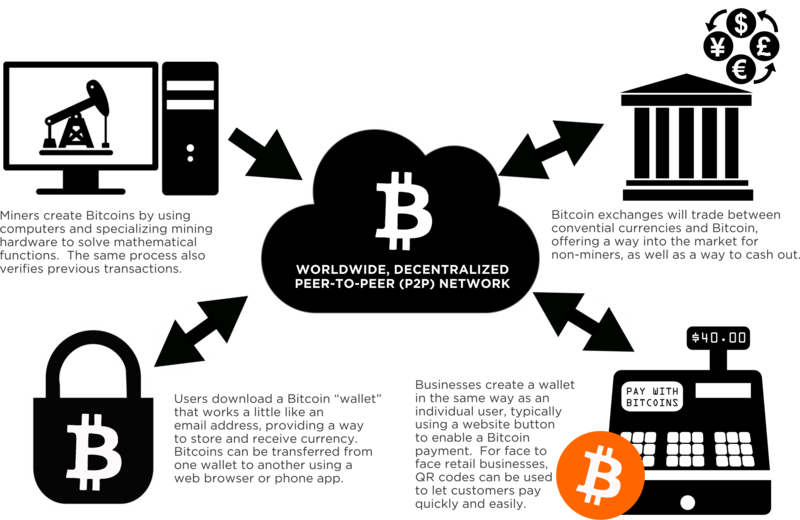 Bitcoin is a peer-to-peer (P2P) payment system introduced as open source software in 2009. The payments in the system are recorded in a public ledger using its own unit of account, which is also called bitcoin. Not yet considered a real currency, bitcoin is nonetheless commonly referred to as a digital currency, virtual currency, electronic money, digital commodity or cryptocurrency. The bitcoin system is not controlled by a single entity, like a central bank or government, which has led worldwide national treasuries to call bitcoin a decentralized currency. Because bitcoins can be transferred directly from one person to another they are sometimes described as digital cash. Bitcoins have many similar properties and uses as mediums of exchange just as gold, silver or other commodities. They can be a trusted store of value in times of high inflation and financial instability as well as empower billions of people worldwide to become financially and technologically independent. Bitcoin evolves the financial sector to a new level of efficiency and era of innovation and as such is one of the most disruptive, and humanity empowering inventions of our time. Just as the internet, e-mail, P2P sharing, social media, and mobile expansion have shaped the technological evolution of human inter-connectivity and access to data, Bitcoin is helping finance and the concept of money to be viewed in digitally evolved formats. The most important part of the bitcoin system is a ledger that records financial transactions in bitcoins. Recording transactions is accomplished without the intermediation of any single, central authority. Instead, multiple intermediaries exist in the form of computer servers running bitcoin software. These intermediaries form a self-sustaining network by connecting over the Internet that anyone can join. Transactions of the form payer X wants to send Y bitcoins to payee Z are broadcast to this network using readily available software applications and recorded on the Block Chain (explained below). Bitcoin servers can validate these transactions, add them to their copy of the ledger, and then broadcast these ledger additions to other servers. Just as a ledger can be used to record transfers of conventional money like dollars, all bitcoin transfers are recorded in a computer file that acts as a ledger called the block chain. Where a conventional ledger records the transfer of actual dollar bills or promissory notes that exist apart from it, similar to debits and credits in accounting bitcoins are simply entries in the block chain and do not exist outside of it. This block chain ledger is distributed on hundreds of thousands of computers on the network to keep redundancy records (multiple distributed copies of the same information). There are already plans to move copies of the block chain into space and broadcast by satellites for nodes and mining confirmations! The public nature of bitcoin means that, while those who use it are not identified by name, linking transactions to individuals and companies can be done by connecting the path that bitcoin ownership takes and following the trail to a point of exit (change to conventional currency) at an exchange or broker or bitcoins. Additionally, many jurisdictions require exchanges, where people can buy and sell bitcoins for cash, to collect personal information. In order to hide the link between individual and transaction, some use a different bitcoin address for each transaction and others rely on so-called mixing services that allow users to trade bitcoins whose transaction history implicates them for coins with different transaction histories. It has further been suggested that bitcoin payments should not be considered as more anonymous than credit card payments. The ownership of bitcoins associated with a certain bitcoin address can be demonstrated with knowledge of the private key belonging to the address. This is similar to having a debit card (or account number) and having the PIN for it. For the owner, it is important to protect the private key from loss or theft. If a private key is lost, the user cannot prove ownership by other means. The coins are then lost and cannot be recovered. Since anyone with knowledge of the private key has ownership of any associated bitcoins, theft occurs when a private key is revealed or stolen. Bitcoins are created as a reward for payment processing work in which users offer their computing power to verify and record payments into the public ledger. Called mining, individuals or companies engage in this activity in exchange for transaction fees and newly created bitcoins. Besides mining, bitcoins can be obtained in exchange for other currencies, products, and services. Users can send and receive bitcoins electronically for an optional transaction fee (to speed up the transfer) using wallet software on a personal computer, mobile device, or a web application. Bitcoins can also be printed onto paper (like $ bills) or even stored on minted coins as a secure offline storage method or medium of offline exchange (usable as cash). Maintaining the Blockchain is called mining, and those miners who do are rewarded with newly created bitcoins and transaction fees. Miners may be located on any continent and process payments by verifying each transaction as valid and adding it to the block chain. As of 2014 payment processing is rewarded with 25 newly created bitcoins per block added to the block chain. To claim the reward, a special transaction called a coinbase is included with the processed payments. All bitcoins in circulation can be traced back to such coinbase transactions. The bitcoin protocol specifies that the reward for adding a block will be halved to 12.5 bitcoins in 2017 and halved again approximately every four years. Eventually, the reward will be removed entirely when an arbitrary limit of 21 million bitcoins is reached c. 2140, and transaction processing will then be rewarded by transaction fees solely. Paying a transaction fee is optional, but may speed up confirmation of the transaction. Senders have an incentive to include transaction fees because their transactions will likely be added to the block chain sooner; miners can choose which transactions to process and prefer to include those that pay fees. As of 2014 mining has become quite competitive, and the process has been compared to an arms race as ever more specialized technology is utilized. The most efficient mining hardware makes use of custom designed application-specific integrated circuits (ASICs), which are much faster and use less power compared to general purpose microprocessors, such as x86 processors. Without access to these purpose built machines, a bitcoin miner is unlikely to earn enough to even cover the cost of the electricity used in his or her mining efforts today. The individual odds of winning the reward for adding a block to the block chain decrease alongside an increase in the number of miners. Many miners participate, but the reward for each block only goes to a single bitcoin address. As of 2014 it has become common for miners to join organized mining pools, which split the work and the reward among all participants and make mining a less risky endeavor. Even for those who join pools, the cost of the electricity necessary to mine may outweigh the bitcoin rewards from doing so. While wallets are often described as being a place to hold or store bitcoins, due to the nature of the system, bitcoins are inseparable from the block chain transaction ledger. If they must be thought of as distinct from the block chain, you can say that bitcoins are held in it. A better way to define a wallet is something "that stores the digital credentials for your bitcoin holdings" and allows you to access (and spend) them. Bitcoin uses public-key cryptography, in which two cryptographic keys, one public and one private, are generated. The public key can be thought of as an account number and the private key, ownership credentials. At its most basic, a wallet is a collection of these two keys. Most bitcoin software also includes the ability to make transactions, however. Perhaps better termed physical wallets, physical bitcoins are ubiquitous in media coverage and combine a novelty coin with a private key printed on paper, metal, wood, or plastic. Physical bitcoins aren't widely seen outside of pictures in news article, but for those serious about security, storing private keys on paper printouts or in offline data storage devices is the best option. Desktop wallets are the most private after printed offline storage methods, as they store your bitcoins on your own computer and allow you to control the security level. However, that also means that you need to install software than can take up a lot space since you always have to download and update the Blockchain as it updates itself. Print wallets are one of the most secure methods to store your bitcoins. You can print the private key on any piece of paper, or even write it down, and store in a vault for maximum protection. You can always display the public key and use it to receive payments, but without the private key, you cannot spend them. Mind wallets (aka memory wallets) are the most secure method to store your bitcoins. This involves memorizing your private key then destroying all physical references to the key. You can also write down or print part of your key, and memorize the rest. If you forget even the order of one letter or number, your bitcoins may be lost forever, so exercise caution with this! Bitcoins can be bought and sold around the world with many different currencies from individuals and companies. Perhaps the fastest way to purchase bitcoins is in person or at a bitcoin ATM for cash. Participants in online exchanges offer bitcoin buy and sell bids. Using an online exchange to obtain bitcoins entails some risk, and according to one study, 45% of exchanges fail and take client bitcoins with them. Since bitcoin transactions are irreversible, sellers of bitcoins must take extra measures to ensure they have received funds from the buyer. Bitcoin wallet software, sometimes called a bitcoin client software, allows a user to transact bitcoins. A wallet program generates and stores private keys, and communicates with peers on the bitcoin network. The first wallet program called Bitcoin-Qt was released in 2009 as open source code. It can be used as a desktop wallet for payments or as a server utility for merchants and other payment services. Bitcoin-Qt, also called Satoshi client, is sometimes referred to as the reference client because it serves to define the bitcoin protocol and acts as a standard for other implementations. As of version 0.9, Bitcoin-Qt has been renamed Bitcoin Core to more accurately describe its role in the network. When making a purchase with a mobile device, QR codes are used ubiquitously to simplify transactions. Several server software implementations of the bitcoin protocol exist. So-called full nodes on the network validate transactions and blocks they receive, and relay them to connected peers. Integral to bitcoin security is the prevention of unauthorized transactions from an individual's wallet. Each wallet has an associated Public Key (to receive bitcoins) and a Private Key (to spend bitcoins) that is unique to each wallet. A bitcoin transaction permanently transfers ownership of bitcoins to a new address, a string having the form of random letters and numbers derived from public keys by application of a hash function and encoding scheme. The corresponding private keys act as a safeguard for the owner; a valid payment message from an address must contain the associated public key and a digital signature proving possession of the associated private key. Because anyone with a private key can spend all of the bitcoins associated with the corresponding address, protection of private keys is quite important. Loss of a private key may result in theft, which has occurred on numerous occasions. The practical day-to-day security of bitcoin wallets is a concern just like the security of other forms of payment. Risk of theft can be reduced by generating keys offline on an uncompromised computer and saving them on external storage or paper printouts. .